You've heard the buzz, read the reviews, and consulted the stars; all signs point to The Elder Scrolls V: Skyrim being the second coming of Oblivion, only bigger, better, and bolder than its beloved predecessor. And for the most part it is, but there are some definite flaws on this shiny dragon-clutched diamond. Now keep in mind I'm not trying to rain on Bethesda's parade or minimize the accomplishment of Skyrim in any way. It's a game deserving of praise (which I'll get to eventually), and these five flaws, while annoying, for the most part don't affect the overall experience. This is just a small selection of agonizing issues that I need to get off my chest before I get back to my Dragonborn. One of the most criticized elements of the previous two entries in The Elder Scrolls series, Bethesda has certainly improved character animation a great deal for Skyrim, to the point where third-person play is a viable option, as long as you don't make any sudden moves or attempt to climb down the side of a mountain. In fact, unless you're running in a straight line or fighting (meaning too busy to notice), that old familiar jerkiness rears its ugly head. And forget about climbing; there are no animations for such actions, and simply walking down the side of a mountain half sunk into the rock doesn't do a lot for immersion. Possible Solution: Let's motion capture some people! Call up Rockstar, see if they know anybody. My least favorite part of playing any open-world Bethesda game is selecting my hair. As demonstrated in my character creation video for Skyrim, this is not an area that Bethesda has shown gobs of improvement in with this latest title. It's getting better, and the higher-quality faces certainly help, but faced with the decision of wearing the hideous polygon hair and a skullcap textured to look like hair, the skullcap wins every time. Of course you wind up with a helmet before too long. 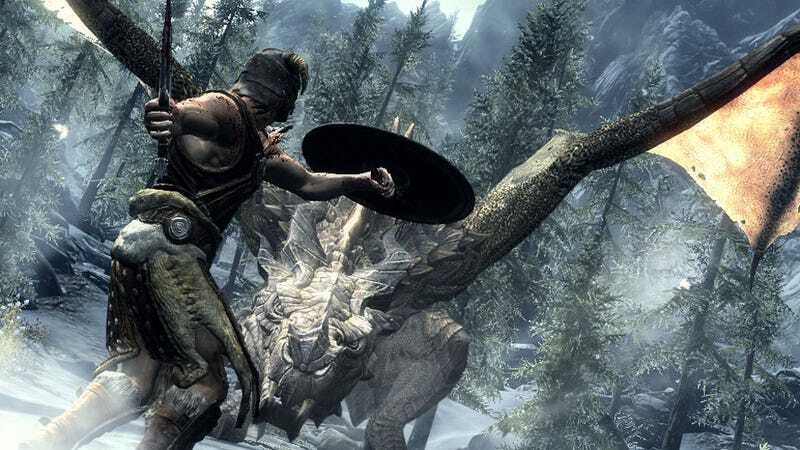 In fact, the Dovahkiin image that's been circulating since the early announcement days encourages players to wear a helmet, so Bethesda is likely aware of the issue. Possible Solution: Lose the hair selector and just have everyone select a helmet at character creation, or require all prisoners' heads be shaved before transport and incarceration. Yes, even the kitty people. One day there will be an Elder Scrolls game in which I don't have to sit through a loading screen every time I enter a building; I recognize that this is a matter of time and computing power and if I just wait for it it will eventually arrive. It always flummoxes me when I'm exploring a vast open world that stretches for miles in every direction, every inch explorable, yet to enter a thatched roof cottage we've got to kick things into high gear. More of an expectation than a real disappointment, at least Bethesda made some excellent interactive loading screens to help pass the time. Lag, on the other hand, could probably be avoided. Playing through the Xbox 360 version my travels have been intermittently interrupted by brief pauses, during which I assume the next part of the world is trying to load behind-the-scenes, but fails. A brief pause now and then while travelling isn't incredibly bothersome, but coupled with the lag I've been experiencing opening up the game's nifty new cross menu — enough to make me worry the game might have locked up on me — then yes, I'm somewhat disappointed. The problem doesn't happen all the time — I suspect it's tied to caching — but it's there. Possible Solution: The magical consoles of the future, pixel grease. Here lies my biggest Skyrim disappointment. I'm given a vast, gorgeous realm to explore, decked out in realistically designed armor and weapons, and pitted against lifelike creatures from mundane to horrific. What happens next should be the ringing of steel, the crumpling of armor under powerful blows; a deadly dance performed by the deadliest of foes. What actually happens is a great deal of flailing. One button controls the item or spell in your left hand, another handles the right. This works fine for spell casters, but for melee players? Not so much. As advanced and gorgeous as Bethesda's game engine is, it's not a miracle worker. Building a truly satisfying first-person melee and magic battle system is a monumental task. If the game were purely a PC monster it would be one thing; a mouse does wonders for directional sword strikes. Then again, both consoles playing host to Skyrim have devices capable of adding extra depth to combat. I can't fault Bethesda for not supporting technology that wasn't around when they started developing the game, but maybe next time? Massive. Threatening. The darkness spreading across Skyrim is the shadows cast by dragon wings. These vile creatures are at the very heart of the game's conflict, and provide the greatest challenge ever faced in the history of The Elder Scrolls. Unless you hide behind a rock. They hate that. It confuses them so much that once they're done breathing fire they'll sit, bewildered, giving you the opening you need to attack. Now I've only fought a handful of dragons in the game so far, but those I have faced were only impressive graphically. I should have been terrified for my life. I should have gotten the impression that I was facing insurmountable odds, but I do not. It's the nature of the beast, you see. Thanks to the combat system (see above) there really isn't any way to make a fight with a dragon as dynamic and entertaining as it should be. It reduces what could have been some truly epic encounters into rounds of 'Can I thwack it yet? Okay, I thwack it now.' Attacking the flying dragon with magic and arrows makes me feel as if I were fighting more dynamically, but really I'm just speeding up the process a little. My lovely domestic partner put the whole dragon thing into perspective after watching me play for several hours. She observed that while fighting a dragon, I was calm and reserved. When facing off against the Snowy Saber Cat in the clip here, I screamed, ran, and nearly peed myself. Now before we start with the "Hey, he's hating on Skyrim! Burn him! ", this isn't about hate. It's just a means of pointing out that as good as this game is, the next one could be even better. Can you imagine?